This analysis draws upon testimony on U.S. International Religious Freedom Policy: the Outlook for 2010, before the Foreign Affairs Subcommittee on International Organizations, Human Rights, and Oversight, February 3, 2010. Read the full transcript including additional global findings and methodology at pewforum.org . Restrictions on religious practice are far from uncommon in today’s world. 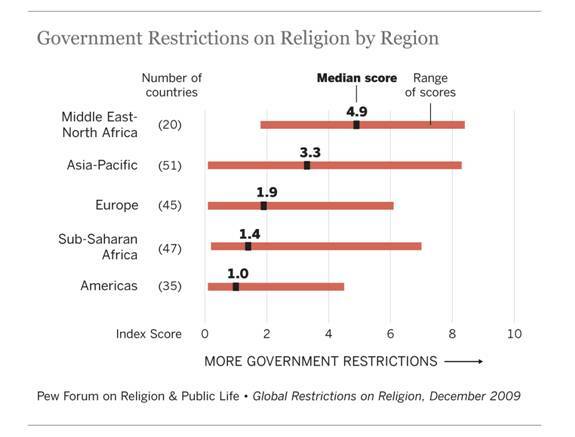 The Pew Forum on Religion & Public Life has found that 64 nations, about one in three among the countries and territories covered by its Global Restrictions on Religion study, have high restrictions on religion either because of government restrictions, social hostilities or both. And because some of the most restrictive countries are very populous, that means about 70% of the world’s population lives in countries with high or very high restrictions on religion, the brunt of which often falls on religious minorities. As shown in the chart below, Indonesia, where President Barack Obama now plans to visit in June and where he spent part of his childhood, is among those countries of the globe where such restrictions and hostilities are highest. In the chart we’ve plotted the 25 most populous countries by their scores on both measures, with increases in social hostilities going up the chart and increases in government restrictions going to the right. 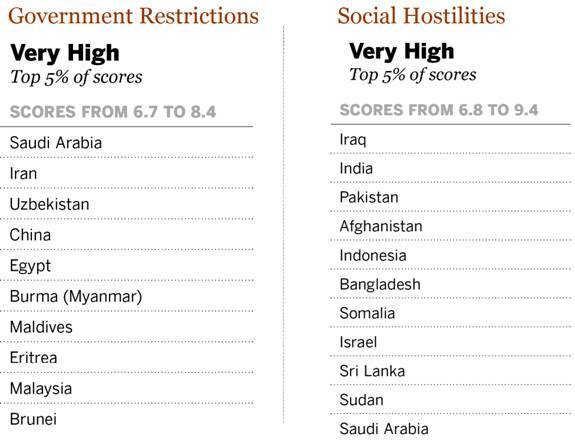 If a country has both high government restrictions and high social hostilities, it will be located more toward the top right corner of the chart, as is Indonesia along with Pakistan, Indonesia, Egypt and Iran. Governmental restrictions include not only national laws and policies, but also actions by local governments and officials, which we find account for a sizeable portion of government restrictions worldwide. In this regard, however, the situation in the Asia-Pacific region is mixed because it includes some countries and territories with low governmental restrictions — such as Japan and Taiwan — as well as some countries with very high government restrictions, such as China and Burma. Indeed, of the 10 countries with very high government restrictions, only two are in the Middle East and North Africa (Saudi Arabia and Egypt), while seven are in Asia (Iran, Uzbekistan, China, Burma, the Maldives, Malaysia and Brunei). Only one is in Sub-Saharan Africa (Eritrea). 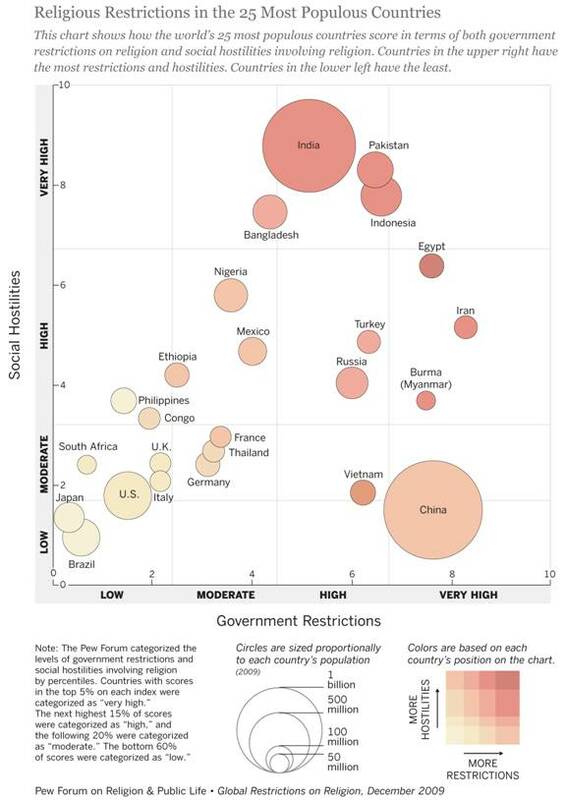 On the other end of the spectrum, you can see India in the top-center part of the chart, indicating that social hostilities tend to be higher than government restrictions, though both tend to be high. Nigeria is another example of a country where there are higher social hostilities than government restrictions on religion. In the bottom left-hand corner of the chart are a cluster of countries. Only two of the 25 most populous countries are low on both measures — Japan and Brazil. The U.S. falls into the moderately restrictive category in terms of social hostilities, primarily due to frequent, religiously biased hate crimes. For instance, each year law enforcement officials report about 1,400 religiously biased hate crimes in the United States, covering nearly all 50 states. So, in sum, this scatter plot provides a way to understand the main sources of restrictions on religious groups within a given country. It is important to remember, though, that our study is just a snapshot of a particular time period, and situations can and do change. For instance, although Malaysia was among the countries with the highest government restrictions, it had low social hostilities involving religion during the time period studied. However, had the recent social violence surrounding the dispute over whether Christians can use the word “Allah” for “God” happened during the study period, Malaysia’s social hostility score would have been higher. This analysis draws upon testimony on U.S. International Religious Freedom Policy: the Outlook for 2010, before the Foreign Affairs Subcommittee on International Organizations, Human Rights, and Oversight, February 3, 2010. Read the full trasncript including additional global findings and methodology at pewforum.org. 1. Although it is very likely that more restrictions exist than are reported by the 16 primary sources, taken together the sources are sufficiently comprehensive to provide a good estimate of the levels of restrictions in almost all countries. The one major exception is North Korea. The sources clearly indicate that North Korea’s government is among the most repressive in the world with respect to religion as well as other civil and political liberties. (The U.S. State Department’s 2008 Report on International Religious Freedom, for example, says that “Genuine freedom of religion does not exist” in North Korea.) But because North Korean society is effectively closed to outsiders and independent observers lack regular access to the country, the sources are unable to provide the kind of specific, timely information that the Pew Forum categorized and counted in social science parlance) for this quantitative study. Therefore, the report does not include scores for North Korea.